Tomato Basil Cocktail. 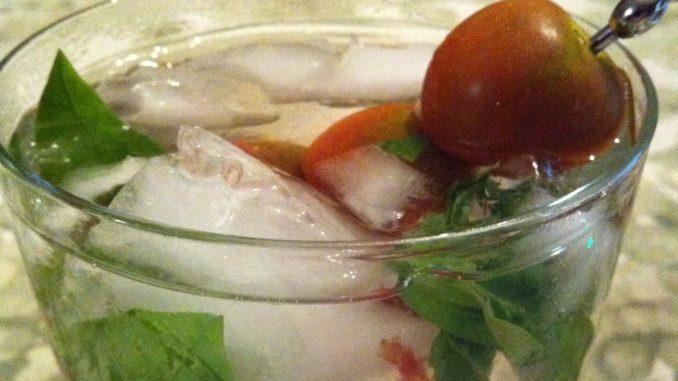 When Summer gives you lots of tomatoes and basil, and you’ve already made vats of sauce, consider this savory and slightly spicy cocktail. Summer is coming to an end…yet with the availability of fresh tomatoes and fresh basil in the grocery stores year ’round, you can enjoy this seasonal cocktail more often. My basil has grown nicely so far this year. Last year and the previous year, my basil succumbed to the basil blight which meant no basil by mid-August. 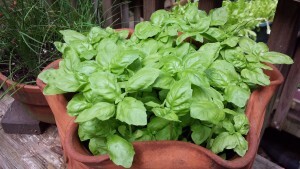 So far, we still have healthy basil in the kitchen garden. 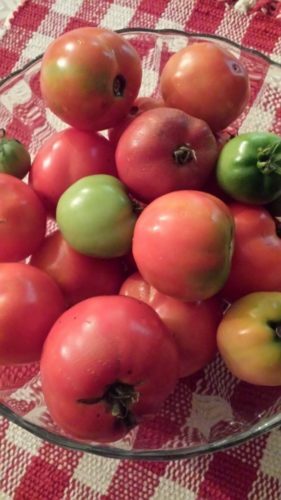 Also my bushy larger tomato plants did well this summer. The smaller cherry tomato plants — not so much. We did get a lot of rain though so that could be one reason. 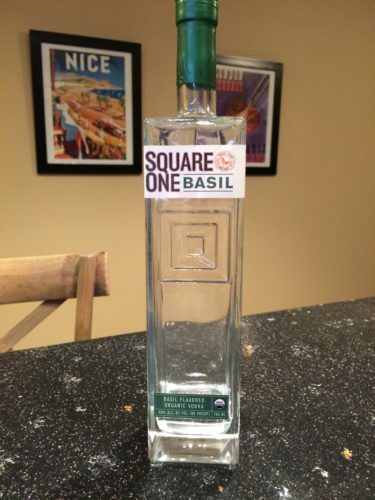 The Square One Vodkas are organic spirits and come in some refreshing flavors such as Botanical, Bergamot, Basil, Cucumber, and Plain Organic. My favorite is the Basil. The citrusy Bergamot is delicious over ice with freshly-squeezed orange juice and a healthy splash of ginger beer. The Cucumber is tasty after shaken with fresh ginger and a squeeze of lemon juice. This Tomato Basil Cocktail has been on my summer beverages list for quite a while. I love the fresh look of the red and green contrasting with the clear liquid. The color combo reminds me of the upcoming winter holidays which will be here entirely too quickly. 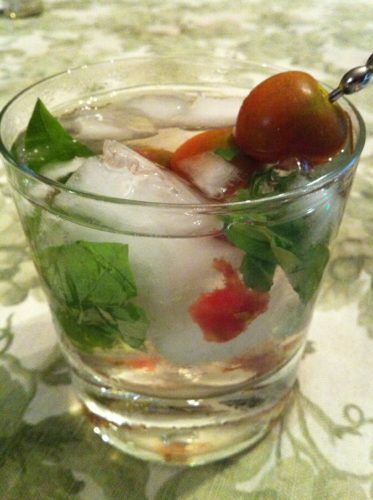 Just muddle some cherry tomatoes and basil in a cocktail shaker. Add ice cubes, basil and plain vodkas, simple syrup, lemon juice, and a dash of cayenne pepper. Then, shake until well mixed and strain into a glass. 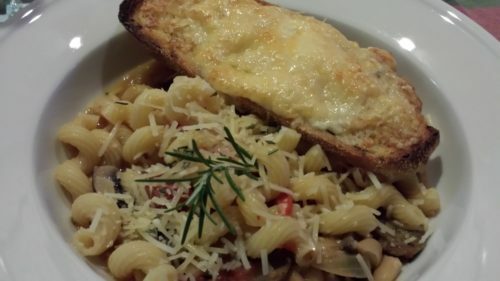 Garnish with whole cherry tomatoes and torn basil leaves. Enjoy a taste of summer!! 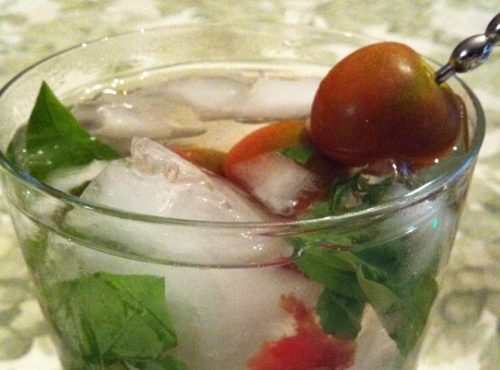 In a cocktail shaker, muddle the cherry tomatoes and basil leaves. Add the ice cubes, vodkas, simple syrup, lemon juice, and cayenne pepper. Shake the mixture until the ice cubes sound like they are breaking up. Strain into a martini glass or over a few ice cubes into an Old-fashioned cocktail glass. Garnish with three whole cherry tomatoes on a skewer and a few torn pieces of basil leaves. Enjoy! Makes one savory and slightly spicy cocktail. Offer with my Smoked Whitefish Mini-Toasts, my Garlicky White Bean Dip and toasted baguette slices, or my Mini-toasts with Roast Beef, Horseradish Sauce, Grape Tomato Slices, and Chopped Chives. Variations: You could add some tomato juice for a more “bloody Mary” style of drink. Use less simple syrup for a more savory taste. This beverage is also tasty over ice in a highball glass and topped with some ginger beer.